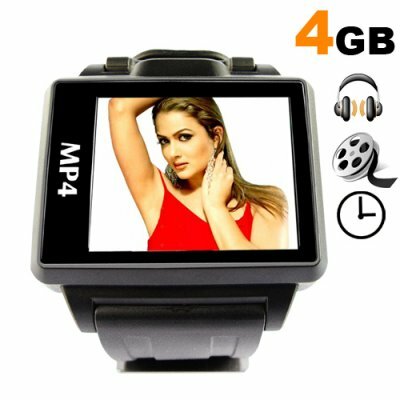 Successfully Added Widescreen MP4 Player Watch - 1.8 Inch Display - 4GB to your Shopping Cart. Looking for a top quality MP4 Wrist Watch Player? Then this is the product you have been waiting for; the 4GB version of our famous CVESG-S818 Widescreen MP4 Player Watch! I like the 4Gb wide screen watch. I have the following suggestions to make it better. 1. Reflective LCD screen so that the watch function can be on all the time. I primarily use mine as a watch. 2. Need to have a time alarm. I just receive this item. it's great : Five EQ and a 3D sound mode, the watch interface is nice. The movie player work fine with a good quality (but the compression ratio is not very good, due to the MTV format), the FM tuner work welll and can scan all the FM band to save station frequencies. All this is automatic. There is also 3 mini games included ! The sound quality of the provided Earphones is standard. But I have tried with better Earphones and so the wacth deliver very good quality sound !